Fort Wayne TinCaps LHP Adrian Morejon struck out six batters Saturday, but his third strikeout was the one that mattered most. That was the one that broke the Midwest League record for most strikeouts by a pitching staff in a single season, besting the 1,294 mark set by the Wisconsin Timber Rattlers last year. Morejon’s six strikeouts, along with one by reliever Andres Munoz, put Fort Wayne’s total at 1,299 with two more games to be played in the regular season. 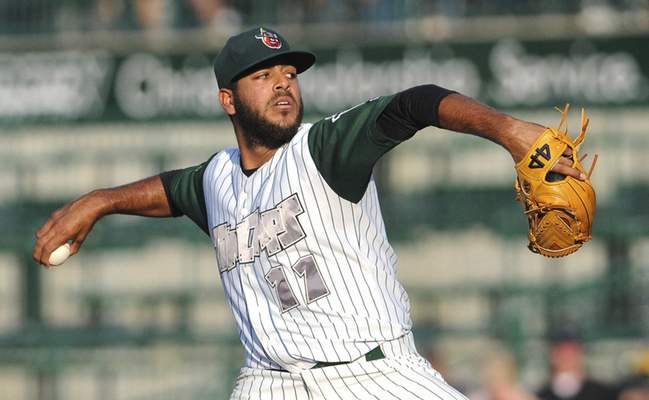 The TinCaps pitcher with the most strikeouts this season is RHP Pedro Avila with 117 Ks in 85.2 IP. On August 8 he set a new franchise record by striking out 17 batters in a single game. Although TinCaps pitchers set a new Midwest League strikeouts record in Saturday’s game, Fort Wayne’s bats stayed silent as the team dropped the rain-shortened contest 2-0 to the Whitecaps. That extended West Michigan’s Midwest League record for shutouts pitched in a single season to 28. The previous record was 23 by the 1974 Quad City Angels. Top Detroit Tigers prospect Matt Manning got the win after scattering two hits and two walks while striking out nine batters in five innings. It was the second consecutive outing in which Manning pitched as good as advertised, following three subpar starts to begin his tenure with the Whitecaps. McDade is 3-3 with a 3.88 ERA, two saves, 61 strikeouts and four walks in 67.1 innings (16 games/seven starts) for the TinCaps. The previous Midwest League record for most innings without issuing a walk was 45, set by RHP William Castro for the 1973 Danville Warriors, who were a Milwaukee Brewers affiliate. Castro went 11-4 with a 1.82 ERA, 12 saves, 104 strikeouts and 24 walks in 114 innings (46 games) for the Warriors that season. The future major-leaguer made one start — and went the distance. This entry was posted in Clinton LumberKings, Fort Wayne TinCaps, Midwest League, Northwest League, Quad Cities River Bandits, Tri-City Dust Devils, West Michigan Whitecaps, Wisconsin Timber Rattlers. Bookmark the permalink.